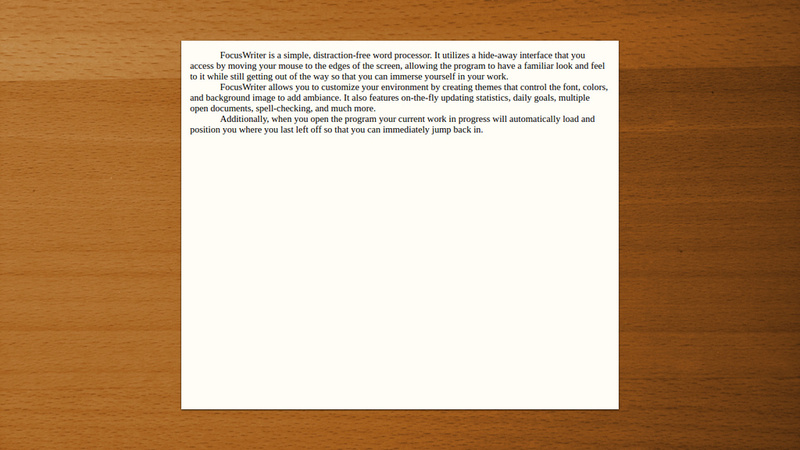 FocusWriter is a full-screen word processor that aims for a distraction-free, immersive way to write and edit. The minimalist interface puts options and tools on the edge of the screen and auto-saves progress. Upon relaunch, the program reloads your last file to make make it easy to jump back into your work. Alternatively, FocusWriter Portable is stealth and automatically adjusts paths. Stealth: ? No. Leaves multiple Qt-related registry keys. How to extract: Download "Windows (Portable)" ZIP package and extract to a folder of your choice. Launch FocusWriter.exe. Fixed: Minimum sizes for page counts were too high. philippe: true. I'll add a note that the minimalism refers to the interface. AndTheWolf - It's fixed. Some editors keep pointing to static URLs instead of the download page for some reason. So, when it's updated, the download winds up wrong. Loner: That's the point of this editor. It's for distraction-free writing. GUI not user friendly, you are stuck with full screen option which does not have the feel other such writer programs. Distraction-free writing similar to q10. Difference is FocusWriter supports RTF (must be turned on in options to use formatting) and about 18 megs.